I can't really explain why but I don't like this woman. I find her pretentious and her music is rather boring and monotonous. Loved the new album. All songs are really really good!! Btw did you notice how the album version of "King Of Anything" is different? I am becoming a Sara freak since the release of her new album. A self-proclaimed "big a cappella nerd," Sara Bareilles has signed on to become a judge on NBC's singing competition "The Sing-Off," and the singer-songwriter tells Billboard.com that she's excited to have landed her first recurring television role. "I've been a big fan of the show and I love the fact that it's highlighting a cappella music," says Bareilles, who performed in an a cappella group in college at UCLA. "I feel like it's the one kind of show that I can hopefully add something to, in terms of having experience or some sort of expertise on it. I'm certainly not a total expert by any means, but I'm very passionate about it." Bareilles, best known for her 2007 single "Love Song," hit No. 1 on the Billboard 200 last year with third studio album "Kaleidoscope Heart," which has sold 344,000 copies since its release, according to Nielsen SoundScan. She will replace former Pussycat Doll Nicole Scherzinger, who served as a judge alongside Ben Folds and Shawn Stockman on the first two seasons of "The Sing-Off" before signing on as a judge on Fox's upcoming U.S. version of "The X Factor." Along with sharing the judges table, Folds and Bareilles will be teaming up in his Nashville studio this fall, where he will be producing a new EP for her. Bareilles will also be releasing a new single, "Gonna Get Over You," in the coming weeks, and will film a video for the track, directed by comedian Jonah Hill, in August. "There's a lot on the board right now, but I'm feeling really fulfilled and inspired about where I'm at and I'm hoping I can just stay in that place for a while," Bareilles says. The third season of "The Sing-Off" premieres on Sept. 19, and Bareilles -- who performed on the season two finale last year -- says she can't wait to see the caliber of the competition. "I was so blown away by the caliber of talent last season," she says, "and so I'm just really excited to see, now that the show is even bigger than it's been, what kind of groups they come up with." "I swear like a sailor. I find great joy in being a little bit sassy and crass, and -- I don't know, going against the grain a little bit. I find a lot of joy in that." Sara Bareilles on the most messed up game of Six Degrees of Kevin Bacon ever. Love this performance. Sara sounded great. It is so awesome to see her singing with the legend. 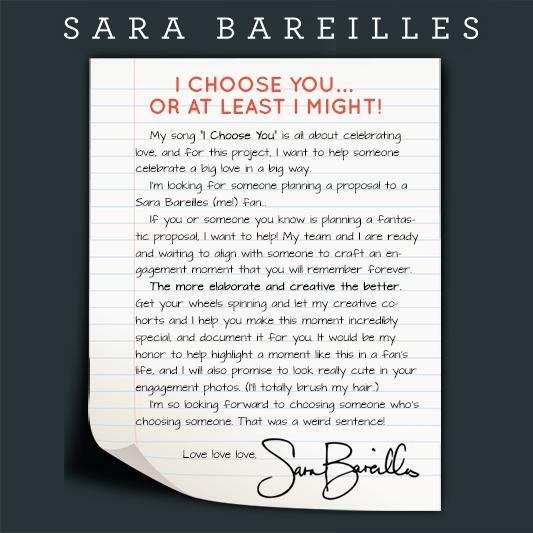 After spending the best part of a year promoting “Brave”, Sara Bareilles has finally moved on to the second cut from Grammy-nominated LP The Blessed Unrest. “I Choose You”, another Mark Endert production, is every bit as uplifting and infectious as her previous single — so expect it to hang around for a minute too. I'm starting "The Blessed Unrest" Survivor soon too ! I feel the same. Although she tries to reach her international fans too through social media, she should do more international concerts in small venues. She's pretty known in here. Not on the same level as Katy or Gaga but I know a lot of people who are into her.